Instead of an ordinary spring mechanism, the model uses a gas cylinder. It gives you extra clearance space, making it easier to transport large boxes. The heavy-duty hinges not only help the ladder unfold smoothly but also keep it from wobbling as you climb. The ladder is difficult to install by yourself. Louisville Ladder deserves its "elite" title. The 3-1/4-inch deep steps increase stability. 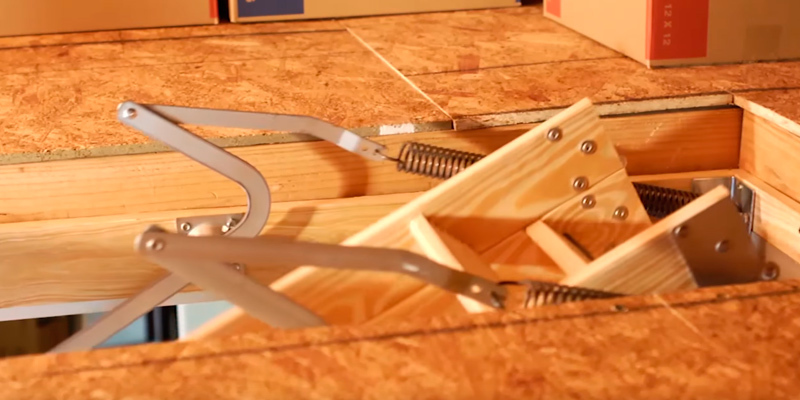 The adjustable shoes make it really easy to fit this attic ladder with any type of flooring. All in all, the model will help any homeowner reach his/her additional storage space with safety and comfort. The S-shape side elements make the ladder elegant and serve as handrails for safety and comfort. Plump users might hit the opening with their back while climbing the ladder. 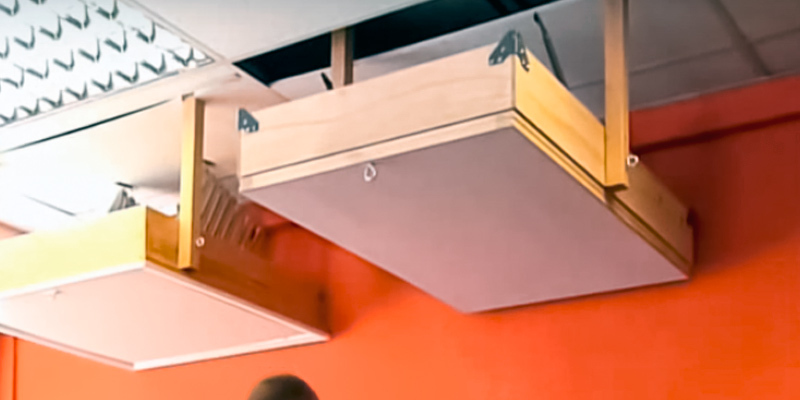 This ceiling ladder is a winner for those having little kids. They will be able to climb up and down safely owing to the non-slip steps. Each step of the ladder is reinforced with a wire rod that provides stiffness and reliability of the entire structure. The model is unfit for houses with a high ceiling. 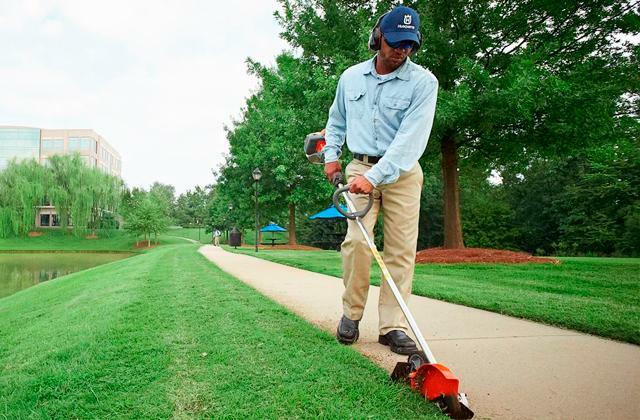 The Louisville S254P is a great pick because of its high quality and safety, as well as a wallet-friendly price. 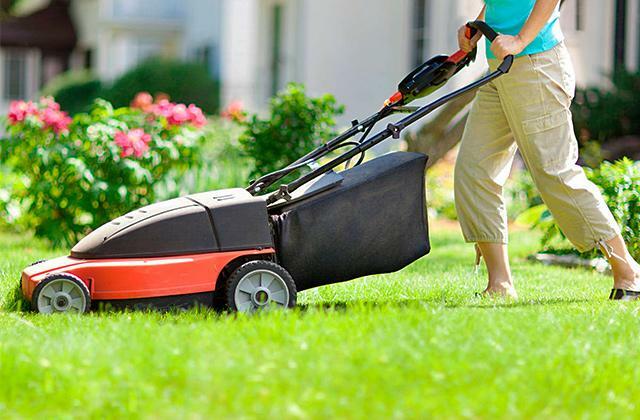 The non-marring feet are great for people who use the ladder on a frequent basis. The assist pole helps you close and open the door in a much safer and more convenient fashion. The oversized handrail lets you climb the stairs without worrying about your safety. Doesn't include a door or a frame box. Werner AA1510 installs into any opening 18" x 24" or larger. 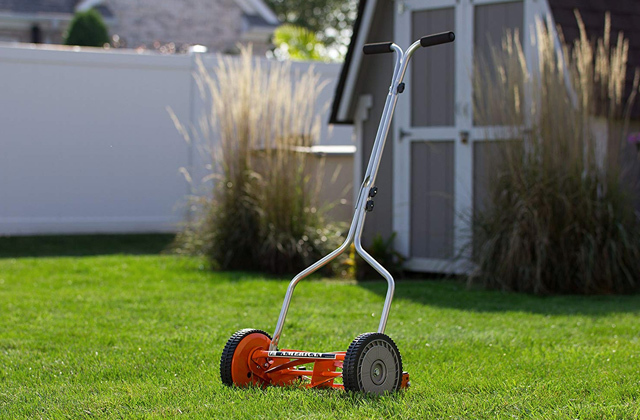 The size, along with the lightweight and telescopic construction, makes the model particularly suitable for hallways, closets, and other types of tight spaces. 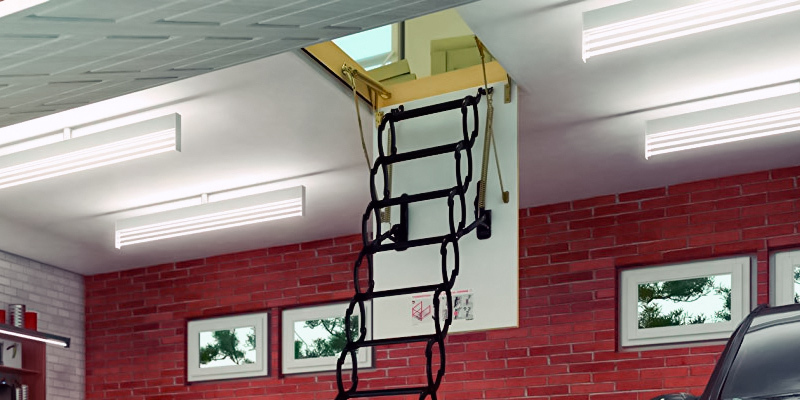 Made of aluminum, the attic ladder is durable and impact-resistant. It's one of the few models with a reversible handrail. 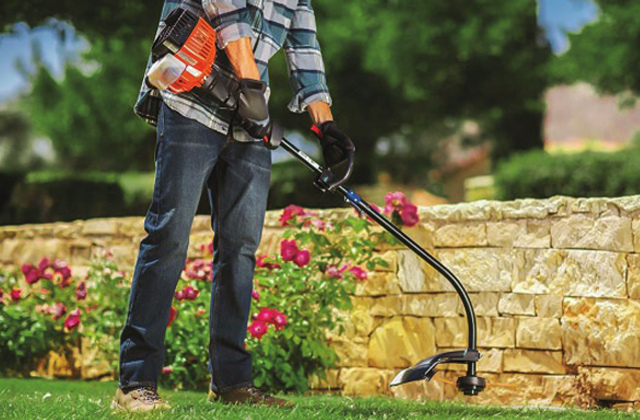 This element offers considerable convenience and adjustability. An unusual way of opening and closing this ladder requires some skills and may be a bit inconvenient it the beginning. These pull-down attic stairs excellently fit the rooms with the ceilings up to 10'8" high. If you are the admirer of high-quality wooden products, don't miss this model! "Elite attic ladder" is a bit of a dubious claim to make. We aren't the biggest fans of these lofty titles. But, if we had to give it to one of these models, it would have to be this Louisville Ladder. On one hand, it's the big things, like the model's maximum load capability of 375 pounds. As you'd imagine, the ridiculous load capacity of this ladder makes it particularly suitable for people that are on the ever so slightly heavier side of the weight spectrum. Of course, it will also allow you to carry heavy items to the attic without worrying about our safety. More often than not, the "elite" title also demands a certain aesthetic and, for the most part, the model delivers on that front. It is nothing too fancy as far as we can tell but the elegant and smooth finish makes the aluminum ladder look sharp and about as sleek as a ladder can look. But, first and foremost, what we like about this model is a number of user-friendly features that make it so comfortable and convenient. The adjustable spring tension will help you customize it according to your needs and preferences. 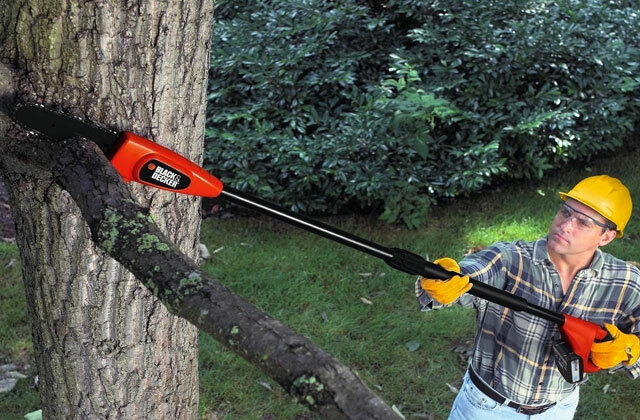 The ergonomic T-handle will keep you safe as you climb the ladder. 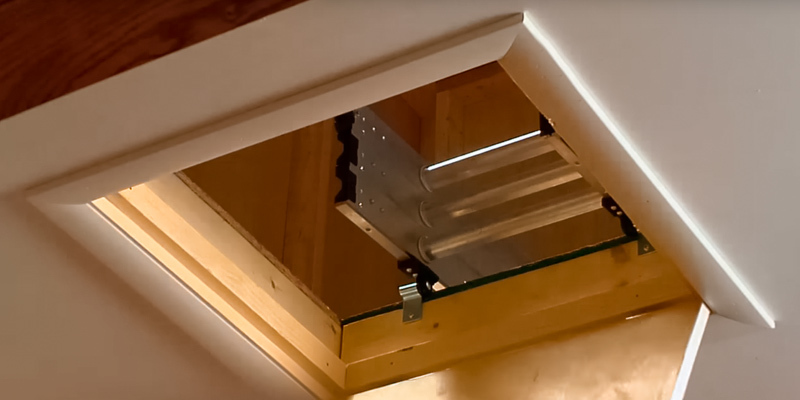 One thing about this model that we definitely couldn't overlook is the fact that it allows a much wider clearance, a nice little adjustment that will help you effortlessly reach the attic. Instead of an ordinary spring mechanism, the model uses a gas cylinder. This cylinder is the key to the increase in clearance. Naturally, the extra clearance space will also make it easier to transport large boxes. But that isn't its only advantage. 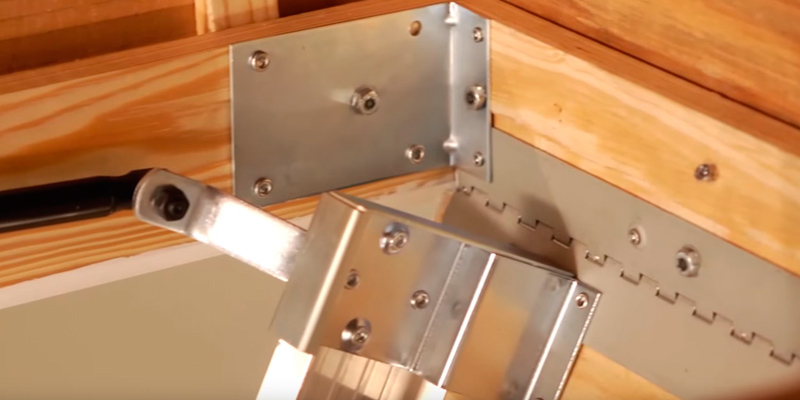 In addition to the increased clearance, the cylinder allows for much smoother opening and closing of the door, mostly because it reduces the force that's required with those standard spring-operated attic doors. The gas cylinder design is also responsible for eliminating the destructive and simply annoying door slamming. Other than the cylinder, the model also boasts reinforced, grooved steps. 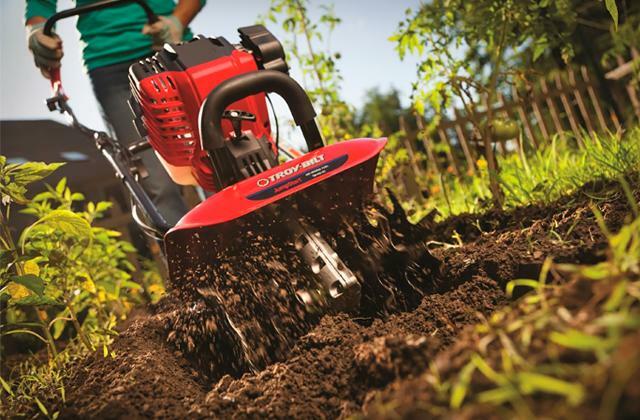 These steps ensure maximum traction without sacrificing user comfort in return. The heavy-duty hinges that the ladder incorporates not only help it unfold smoothly but also keep the ladder from wobbling as you climb. Finally, the slip-resistant cross-tread steps add as much to comfort as they do to user safety. All things considered, we'd say that Louisville Ladder deserves its "elite" title. The 3-1/4-inch deep steps increase stability. 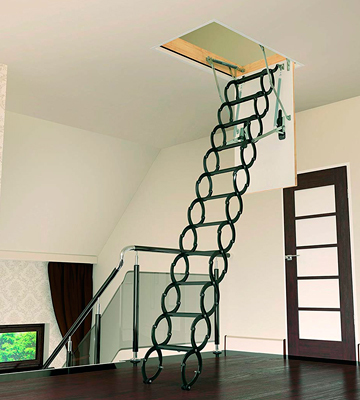 The adjustable shoes make it really easy to fit this attic ladder with any type of flooring. All in all, it will help any homeowner reach his/her additional storage space with safety and comfort. Pull-down ladders, just like the FAKRO LST 66875, gained immense popularity among customers thanks to their usability features and trendy look. Such ladders work best for confined places where there's not a lot of free space and where there's no option to keep it permanently. 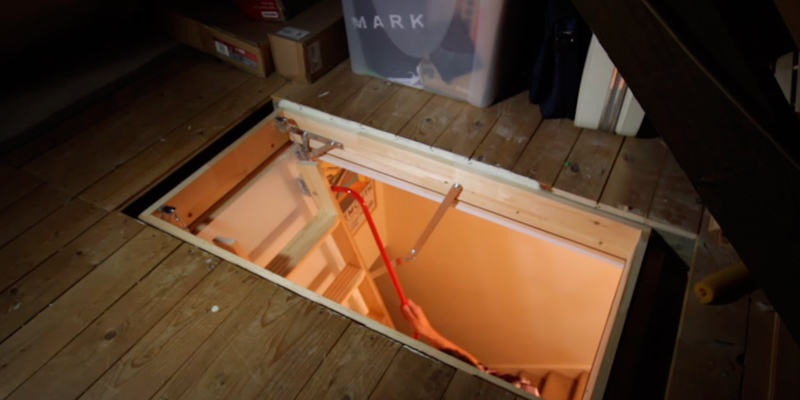 Hidden behind the attic door when not in use it doesn't take any extra inch of your living space yet provides a convenient way of accessing the loft. There are many things that people like about this ladder. The first what atttacts attention is unique ladder's design. The S-shaped side elements that here serve as handrails add style to the whole construction, setting it apart from many of its counterparts. The ladder stairs alongside the rails are made of rust-resistant stainless steel, while the door and the frame are wooden. The maximum load capacity of the ladder here is equal to 300 lbs and this makes it a universal product. 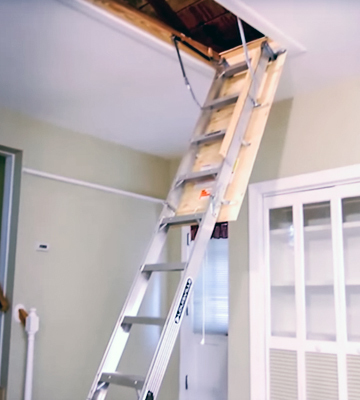 Let's say a few words about the safety features of this ceiling ladder. To keep the warmth and prevent the cold air from getting inside your place, the door has been fitted with insulated panels. When watching the folding mechanism work, we liked that it didn't lag and opened smoothly on a pull. The lock enables at the moment when the door goes back to the initial position, so it's not going to fall back on you. We also liked that the steps here are grooved and non-skid. If you've got kids who love to play around climbing up and down the stairs, you won't need to worry if you use the FAKRO. 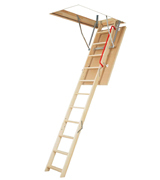 The Lousville S254P is a medium-priced but truly worthy attic ladder. A lot of people opt for wooden products as they are often much more versatile than metal ones. Speaking of ladders, wooden ladders look much more elegant, and you can always color them to match the renovated interior of your room. The Lousville S254P offers compact and discreet installation (just like the majority of folding ladders). What may disclose the presence of the loft in your house though, are the door on the ceiling and the T-shaped handgrip on it that you need to pull. This ladder has been produced in America and this only fact already speaks about its quality. 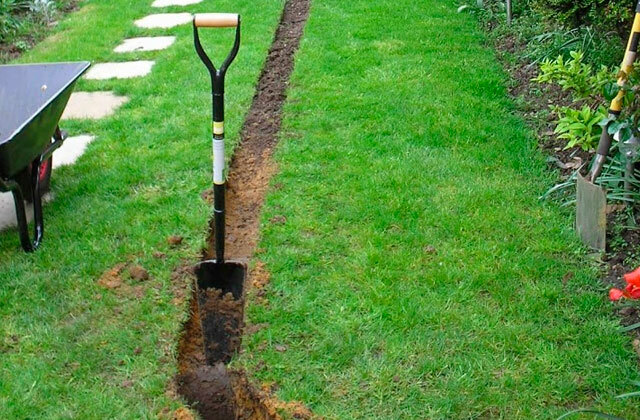 You will definitely like it once you step on it. The heavy-duty hinges open smoothly and securely hold the sections of the ladder. The handrail on the ladder facilitates its climbing up and down. To ensure your more comfortable use, the steps here are made to be furrowed so that you feet didn't slip and you could climb them up more confidently. Meanwhile, to make them durable and long-lasting, the manufacturer used a wire rod for each of the steps. Most things around us have their own history. Ladders aren't an exception. The first mentioning of ladders is found in the writings of ancient Egyptians and goes back to the 4th millennium B.C. After all, even the great pyramids look like ladders! The structures of ladders were also found in Assyria. Built more than 5,000 years ago, the palace of Darius the Great had stairs with carved pictures of people and animals. During the Renaissance, ladders were amply decorated to fit the posh interiors of that time. The craftsmen designed unmatched ladders and adorned them with columns and forged handrails. 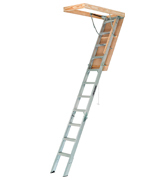 Though it has its flaws, we can't say that we dislike the Werner AA1510 attic ladder. For starters, it is a telescopic ladder and that already makes the model a little bit more versatile than its foldable counterparts. It is also really lightweight. 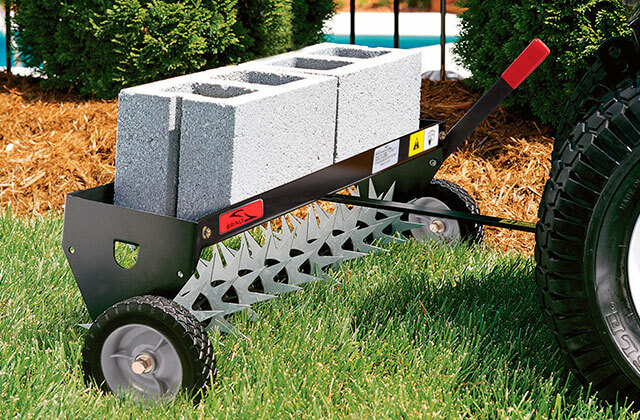 The ladder weighs a smidge above 15 pounds, so you'll easily be able to carry it around. 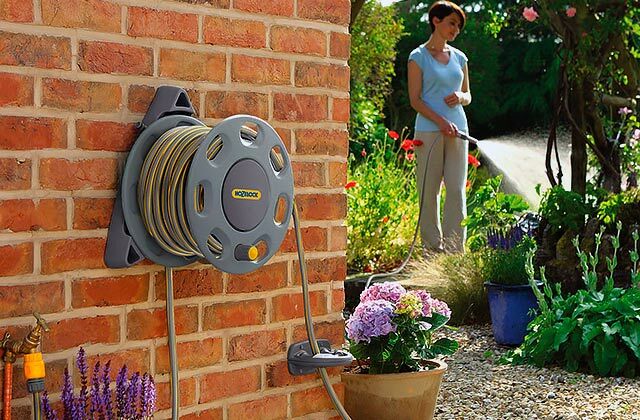 And you probably will want to carry it around as the model effortlessly installs into small openings, providing access to untapped storage space. 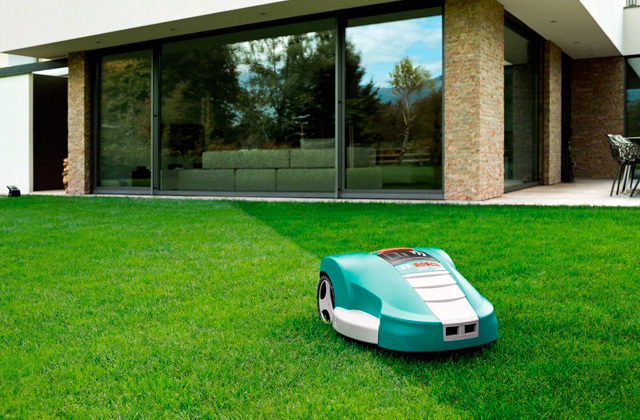 The size, weight, and the telescopic construction make the model particularly suitable for hallways, closets, and other types of tight spaces. 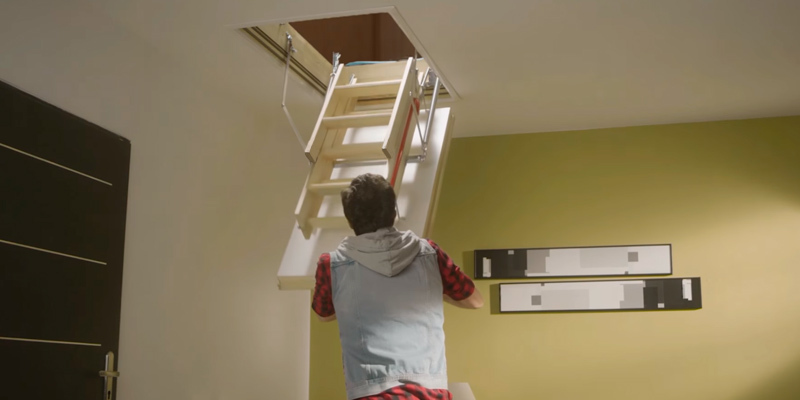 Of course, it is the size that makes the ladder fit those spaces, the weight that makes it easier for you to carry the ladder from one space to the other, and the telescopic design that gives you that quick and hassle-free access to smaller attic openings. But it's not like it doesn't have anything going for it other than the basis of its construction. Sure, as we've said earlier, it has its flaws. For one, the model doesn't include a door, which is a bit of a shame if you ask us. But it does include hardware for the door, so if you don't already own one, you'll only have to buy the attic door itself. The maximum load capacity here is relatively limited. Then again, 250 pounds for a ladder like that will prove more than enough in most cases. There aren't that many things different about ladders, so you really have to look for the small details to find the best deals. Here, those little details include non-marring feet. It may not sound like much but it is the perfect adjustment that you can add to the ladder for people who use it on a frequent basis. Plus, it makes the whole thing far more durable as feet deformation is often one of the first signs of failure with attic ladders. You can also add to that list the assist pole. Sure, it's not a game changer, but it does help you close and open the door in a much safer and more convenient fashion. Speaking of comfort and safety, we definitely couldn't gloss over the convenient oversized handrail. Again, it's nothing we haven't seen before, but plenty of attic ladder manufacturers forget to include this little accessory and we have absolutely no idea why. It keeps you safe, it helps you climb the stairs, and it's not like it takes up any space or makes the product worse from the appearance standpoint. In short, the Werner AA1510 installs into any opening 18" x 24" or larger. 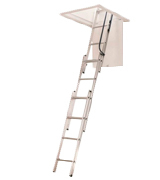 Made of aluminum, the attic ladder is durable and impact-resistant. Considering the relatively modest price tag that it comes with, the model is not a half-bad deal, we can definitely tell you that much. Live in a Room With a High Ceiling? Pick This Ladder! People who adore wooden hardware will surely appreciate this 66809 ceiling ladder from FAKRO. Although metal attic stairs are regarded to be sturdier, this model is nearly as good as they are. After all, it looks fabulous in any interior. We believe, not every aluminum ladder can boast such a trendy look. Generally, this ladder is designed for rooms with the ceilings as high as 10’8”. 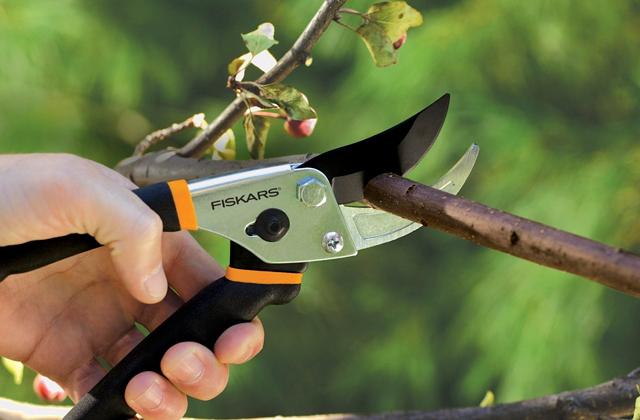 Let's note that the FAKRO 66809 belongs to foldable models and is incredibly easy to collapse and retract. 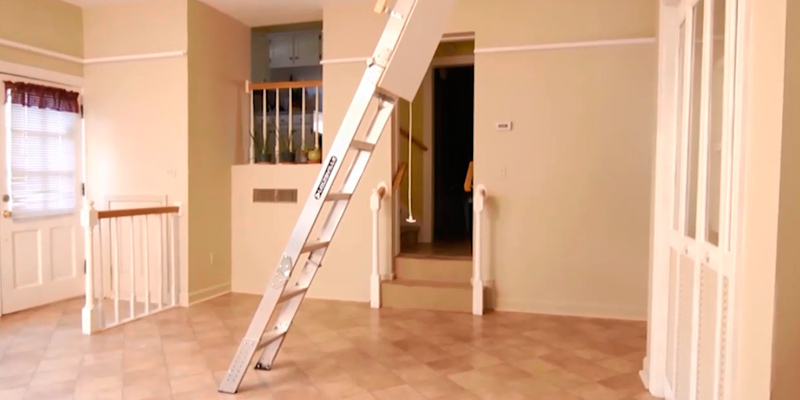 The ladder's door is perfectly balanced and opens smoothly. These attic stairs are made of high-quality pine wood, hence they look great, particularly if you live in a wooden house. 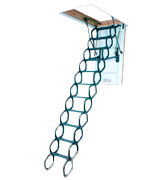 The manufacturer assures that the model meets all technical requirements and safety regulations for such ladders. The grooved steps provide a good grip for your feet, thus you won't slip or fall off it even if you wear slippers. In addition, the package includes a red handrail that you should install for safety purposes. By the way, you can mount it on either side of the ladder. 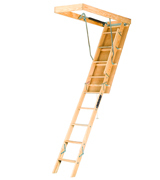 As we have mentioned before, this attic ladder is suitable for people who like wood. It is not for nothing since wood has some real benefits. It provides a wonderful sound insulation and retains heat well thanks to a low thermal conductivity. 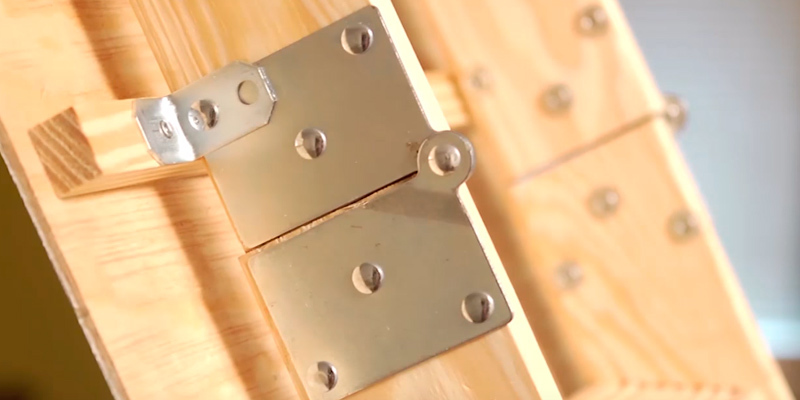 This ladder has a rubber insulating pad on the door, protecting your house against drafts. The model's weight capacity is 300 lbs and it's a great result for a wooden attic ladder. It means that it's safe for even fairly big and plump users to climb up and down this attic ladder without any troubles. Amazing and stylish choice! Living in a big detached house is not only a pleasure but also a luxury, because aside from a spacios living space a homeowner has a lot of options as to where to store different things (and many things). Storing stuff in the attic is perhaps the most popular choice. Though we do not doubt you have at least one ladder in your household, the fact that you've come in this place tells us you may be willing yourself a new one. For those consumers who prefer keeping things up in the attic rather than piling them in a wardrobe, we've picked five great attic ladders which can replace your old one, becoming a decoration element in your living room. We've selected five ladders that differ by size, designs, and folding mechanisms and hope you'll find one that will be right for you. While on the note of ladders, we'd recommend you to go through our top picks of step ladders and telescopic ladders too so you know all the options and choose the most suitable one for your needs. You should know some aspects before choosing an attic ladder. The ladders vary in design and there are 3 major types of them: folding, pull-down, and telescoping. Folding ladders consist of three or four sections that fold up into a compact block stored under the ceiling. Folding ladders can be made of wood or aluminum. 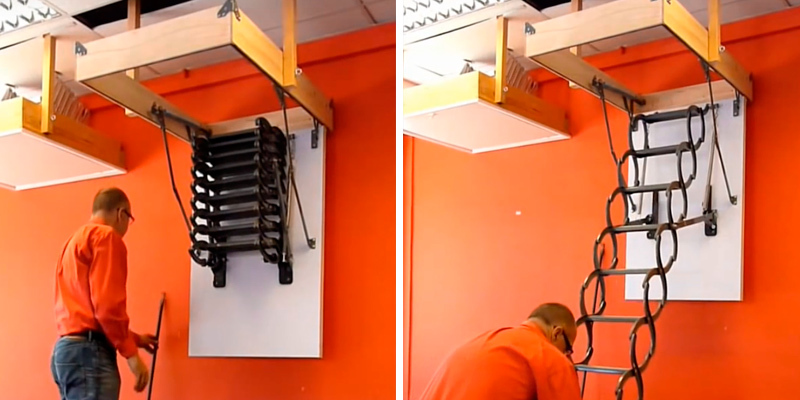 Pull-down ladders have a multi-lever design which unfolds once the ladder's been dragged down. Pull-down ladders are produced only from metal. Telescoping ladders, just like the name says, have a construction similar to a spyglass. 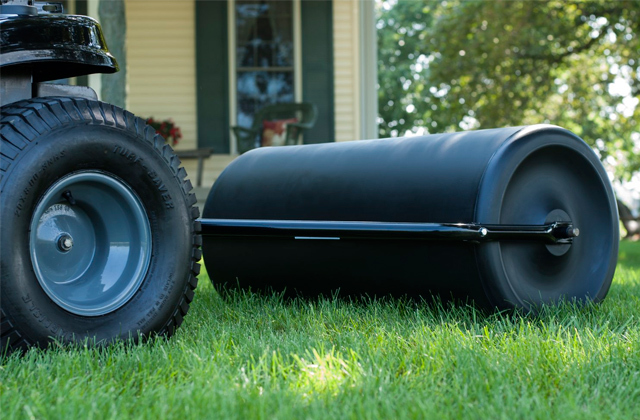 They usually consist of several sections that slide into one another and are made of aluminum to be lightweight. Next, pay attention to the load capacity and what material the attic ladder is made of. These parameters are very important since they can tell you how safe the ladder will be and whether all your family members will be able to use it. Most users tend to opt for ladders with the maximum load bearing capacity, which is a good idea, seeing that you will often need to move bulky things to the loft. Alumimum ladders are a popular choice as they are quite lightweight, yet rigid and corrosion-resistant. Wooden ladders are another alternative that besides sturdiness offer a more elegant look. Finally, you should consider the dimensions of the chosen ladder. 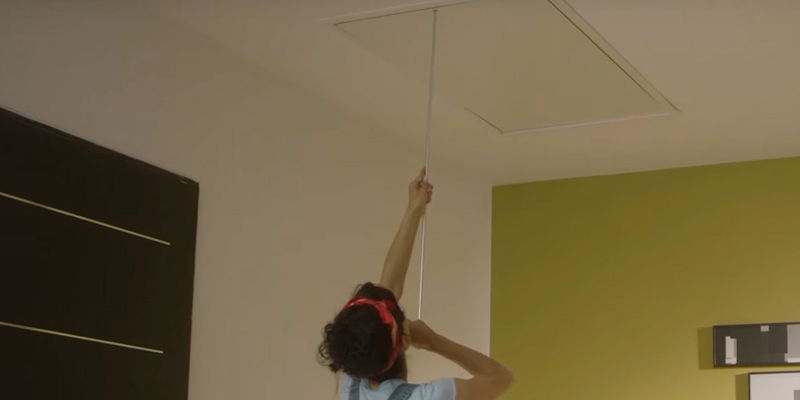 Measure the opening in your ceiling and check whether the model will fit it. If you're only about to have the opening done, you should decide on its location and size before buying a ladder, not other way round. You'd also need to measure the height between the ceiling and the floor to be able to pick the ladder of the right length. The dimensions are always specified by manufacturers, so, it shouldn't be a difficult task to choose the one you need. We'd also recommend you to consider buying a ladder with wider steps. 1. Dave Donovan How to Choose an Attic Ladder System, DoItYourself. 3. Andy Engel Sizing and Choosing Pulldown Attic Stairs, This Old House. 4. Tim Carter Attic Ladders – Choosing a Stairway for Attic Access, Ask the Builder. 5. 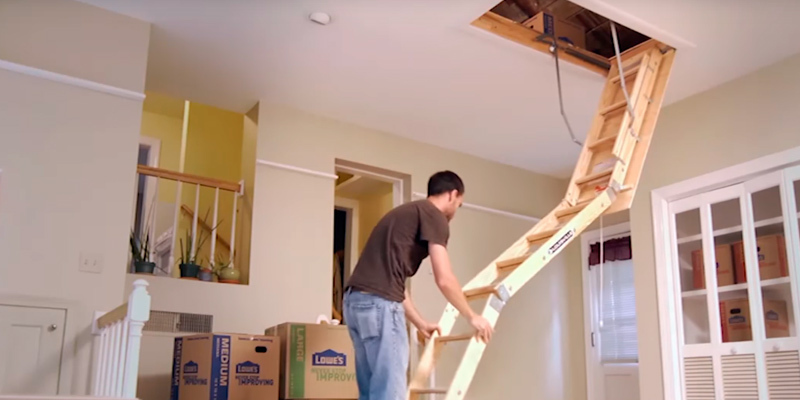 How to Install Folding Attic Ladder, DIY Network. 6. Buyer's guide to loft ladders, B&Q. 7. 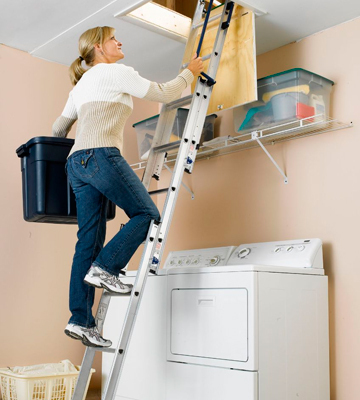 Drop Down vs. Folding Attic Ladder: Pros and Cons, DoItYourself.